- Diameter: 20" Bottom: 42"
With honest intentions to improve the standing we have earned in this arena, we are offering a distinct collection of Tree Model Dustbin. We are leading manufacture and supplies of Tree Dustbin. We use best quality raw material to prepare Tree Dustbin. Please feel free to contact us for any requirements of Tree Dustbin. "We are looking inquiries from North Indian." 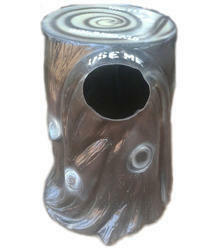 In order to cater the variegated demands of our precious clients, we are manufacturing a wide range of Tree Dustbin. We are engaged in fulfilling the diverse requirements of clients by offering an optimum quality FRP Dustbin. Offered dustbin is designed and manufactured by our professionals using high grade FRP material as well cutting-edge techniques. The provided dustbin is used in school as well college canteens and residential places. We have founded ourselves as a recognized manufacturer of Tree Dustbin. We are able to manufacture Tree Dustbin , with the vast support of our team. We are one of the best manufacturer of Tree Dustbin. We are offering FRP Tree Log Dustbin. Using fine quality raw material and up to date techniques in our state-of -the art manufacturing facility, we offer Tree Dustbin.